During the five lessons, kids will learn that taking care of the earth is a way to love God and to love others. 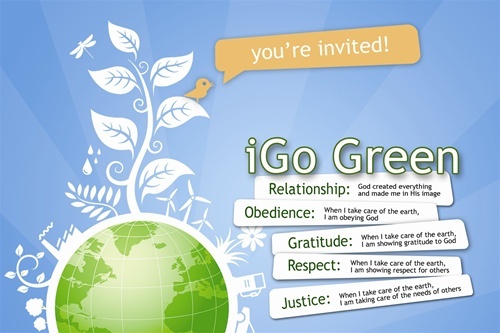 Designed primarily as a camp or VBS, iGo Green can also be modified to use as regular curriculum. Fun skits, game show trivia and environmental activities will give kids an awareness of the world God created. Bible stories, lab demonstrations and small group activities will teach an appreciation for all that He has created. And finally kids will be given an opportunity to act on that appreciation by using recycled materials to make crafts, create exciting games or perform environmental experiments, participating in or giving toward projects to help those marginalized by abuse of the world and making commitments to care for God's creation through obedience, gratitude, respect and justice. The lessons, three hours in length, each contain a large group time. Following that time, rotations including environmental projects, experiments, small group discussion, crafts, snacks, games and bible memory reinforce learning during the group time. Optional activities allow this unit to be stretched to an all day event or overnight camp. This curriculum can be used in various ways: VBS, camp, outreach event, Sunday kid's worship or midweek event. Also included is a PowerPoint presentation to complement each lesson. Lesson 1: Relationship: God created everything and made me in his image. Lesson 2: Obedience: When I take care of the earth, I am obeying God. Lesson 3: Gratitude: When I take care of the earth, I am showing gratitude to God. Lesson 4: Respect: When I take care of the earth, I am showing respect for others. Lesson 5: Justice: When I take care of the earth, I am taking care of the needs of others.